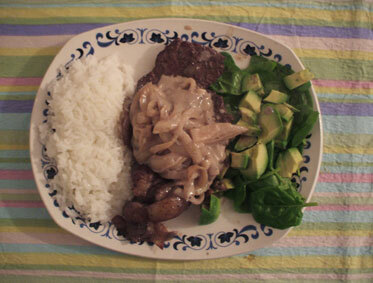 This weekend I had one and a half surprise guests who brought with them offerings of meat; so I thought I'd share this lovely picture of my medium-rare sirloin steak with onions, pepper sauce, rice, spinach and avacado. Unfortunately in my mind this looks more like entrails on top of entrails, but I can assure you it tasted lovely. We fried the steak with seasoning and a little red wine; the pepper sauce was not home-made, but a half a ready-made packet that I had floating around in the back of my cupboard. I have however posted a link here to Delia's version which includes the recipie for the sauce and uses a much more sophisticated cognac instead of the slosh of cheap red wine...her photo is also more aesthetically pleasing.